During the days of September 14 through 17, 1994 the residents of Lafayette, Indiana watched movers roll the 500-ton, vintage 1901 Big Four Depot from Second and South streets to a new location just east of the Main Street bridge. The depot anchored a new “Depot Plaza” complex that became a transportation hub, a link to the Main Street Pedestrian Bridge and entry port to the Wabash Heritage Trail. 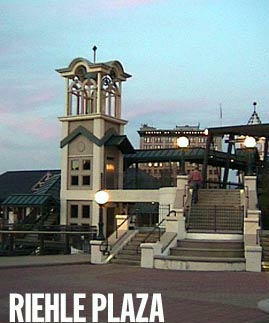 The plaza was later renamed “Riehle Plaza” in honor of the leadership that former Mayor James F. Riehle had provided for Lafayette’s Railroad Relocation Project. With a cost of over $180 million and spanning nearly 30 years, the Railroad Relocation project dramatically altered Lafayette’s landscape. 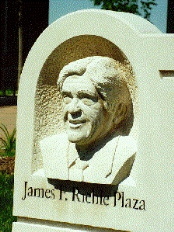 Mayor James Riehle (1930-2007) was the son of Robert and Catherine (Kaiser) Riehle and grandson of Joseph and Anna (Youch) Riehle. His paternal great grandparents, both born in Baden Germany near the town of Achern, were Joseph (1831-1893) and Victoria Schöettgen (1834-1912) Riehle. Mr. Riehle graduated from Purdue with a degree in economics and served in the Navy for four years, including several years aboard the Battleship Wisconsin during the Korean War. He was a Lafayette city councilman for four years before being elected as Mayor in November 1971. As mayor he is known for his support of industrial expansion, including plants opened by Caterpillar and Subaru but is best known for the Railroad Relocation project that eliminated over 40 crossings and so significantly improved Lafayette traffic. 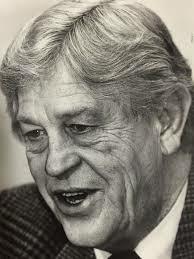 He remained as mayor through 1995. Before becoming mayor, Jim Riehle helped operate the Riehle Brothers Tavern in Lafayette and his “of the people” style helped him retain voter support. There are stories of folks that remembered him from the days at the Tavern, one of whom challenged him, “do you remember my name, Mr. Mayor”. After a pause the Mayor responded that he did not, but he did remember that the citizen drank Falls City Beer. While we have been able to determine the immigrant ancestor for Mayor Riehle (above), there are lots of Riehle’s in Lafayette and a number of businesses that bear our name. We would love to hear from the family and get more color on the Riehle family members there, past and present. Please reply below. Related: Riehle Name Returns to Lafayette’s Tavern Scene for the First Time in a Decade.